Chloe's Chronicals of Chronic Illness-My HPV Vaccine Injury Journey. [2015 Dec] Norway: Force-vaccinated with Gardasil No doctor will listen. They say that Caroline needs mental therapy for her sorrow after my mother’s death. She has had no more tests or treatment because no one believes us. Now she feels pain in her whole body and just wants to sleep. She feels ill all the time. She hardly manages to do anything, has poor memory, heart palpitations, stabbing pain in her chest, and sometimes has breathing difficulties. She often has headaches and now has a poor appetite. She gets tired just by going to the toilet. She can’t walk or cycle any particular distance – her legs go weak and lose feeling. She is bedridden most of the time......The nurse who administered Gardasil against my daughter’s will came to our home and contacted us several times. She told us they were extremely afraid that we could scare other children about taking the vaccine and that we MUST NOT mention the vaccine in connection with our daughter being ill.
[2015 Dec. Norway] Gardasil: Hanging on to Hope Maria (18) has been seriously ill for five years after receiving the HPV vaccine. When she was 12 years old the Norwegian girl, Maria Lysaker Wennersberg, received the HPV vaccine at school. In April 2015 she was diagnosed with POTS which is suspected to be a serious side effect from the vaccine. Most of the time the 18-year-old from Mysen, Norway is bedridden. Sometimes she faints daily. She has lost five important years of her adolescent life and has not been able to attend school for the past four and a half years. Maria, who was formerly active in sports and played baseball, soccer and practiced skiing in winter, now has to be pushed in a wheelchair from her bed into the living room. On the table is a delicious spread of sandwiches her mom, Rita Lysaker, has made. Maria eats nothing. Most types of food, including sweet and fatty food make her nauseous. She struggles enormously with her concentration. ‘But the worst are the fainting spells. I can’t get up from sitting to a standing position without fainting. My pulse accelerates from 50 to 150 in a snap. I can often feel it coming in advance. It begins with blurred vision and then suddenly everything goes black.’ says the 18-year-old. 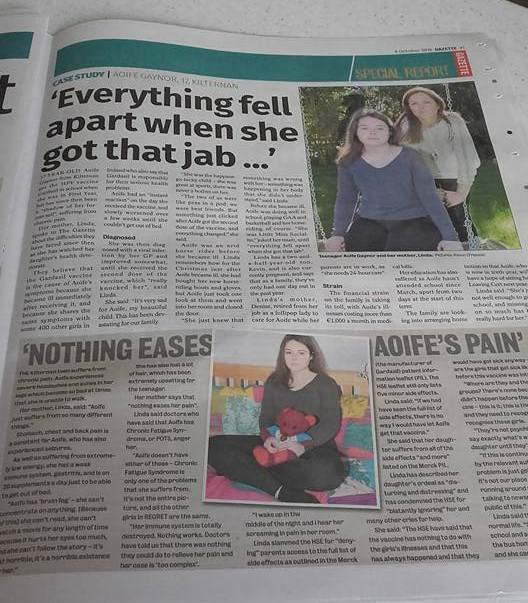 [2015 Nov. Eire] Mother: Gardasil disabled my child Fiona Kirby, Kilbeggan, Co Westmeath, is a member of a new parents’ support group Reaction and Effects of Gardasil Resulting in Extreme Trauma (Regret) for those who claim their teenage girls became ill after getting the vaccine. 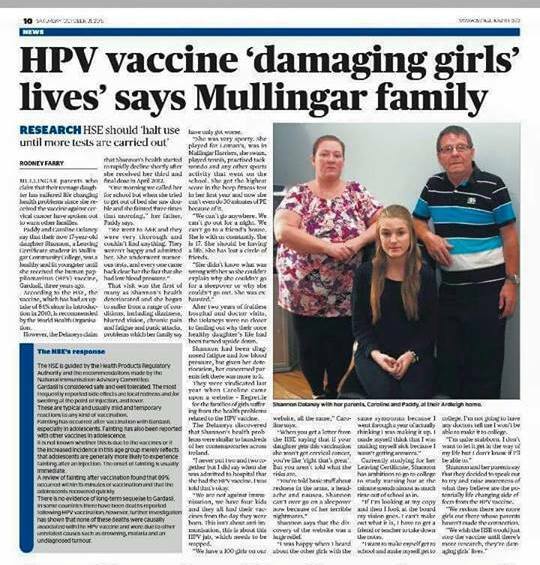 Ms Kirby, a nurse, is seeking a High Court order looking for the withdrawal of the license for the Gardasil HPV vaccine which is currently being offered to 11- to 16-year-old girls as a possible cervical cancer preventative. [2014 May] Gardasil Scandal Brewing in Colombia? now suffers from constant pain throughout her body, muscle weakness, and bleeding from the nose and gums. She has so much pain in her left knee and ankle that she must walk with a cane, and cannot continue her college education. Teenage Girl Becomes Infertile after Gardasil Vaccination a 16-year-old Australian girl (has) suffered "premature ovarian failure" after receiving Gardasil. Her ovaries have shut down, her eggs have been destroyed, and she will never be able to have children. [2012 Oct] Death after quadrivalent human papillomavirus (qHPV) vaccination: Causal or coincidental? a 15-year-old female without a relevant medical history, who developed severe headaches, speech problems, dizziness, weakness, inability to walk, depressed consciousness, confusion, amnesia and vomiting, 14 days after receiving her first qHPV vaccine injection. After the second vaccine booster, her symptoms worsened and she expired 15 days later. Autopsy revealed cerebral oedema and cerebellar herniation indicative of a focally disrupted blood-brain barrier. Wrongly injected toddler fights leukaemia A Hamilton toddler who was mistakenly injected with a vaccine to prevent cervical cancer when he was just six weeks old has developed a rare form of leukaemia. Father of Gardasil Injured Girl Speaks Where I take my son to therapy there is a 13 yr old girl who just recently became paralyzed from the guardasil shot and her mom has struggled as wwell with dr.’s not wanting to acknowledge that the shot caused it. She was fine before the shot. She had all 3 shots and she couldn’t pinpoint it it at the time to the shots but she was having stomach problems right after the first shot and just kept getting weaker up until the last shot then she became paralyzed. Her mom has had to quit her job to take care of her and her 3 other siblings and she is a single parent so she is having a hard time. It breaks my heart every time I see that young girl come in to therapy in a wheelchair. [2011 Oct] Class action on cancer vaccine Gardasil A MELBOURNE woman who suffered an auto-immune and neurological attack after being injected with the cervical cancer vaccine Gardasil is leading a class action against its manufacturer. Seven other Victorian women who are considering joining the court case against Merck say they have suffered anaphylaxis and physical breakdowns as a result of the vaccine. One has attributed a miscarriage to the injections. Naomi Snell, 28, said her life was put on hold for more than two years after she lost the ability to walk, battled crippling back and neck pain, and suffered convulsions that started soon after her first injection in July 2008. [2011 Jan] H1N1 Vaccine-Relate Miscarriages Eileen Dannemann, President of the National Coalition of Organized Women, speaks with Michael Ostrolenk about the 2,500% increase in H1N1 (Swine Flu) Vaccine related miscarriages. The number of spontaneous abortions reported in the Vaccine Adverse Event Reaction Database (VAERS) increased from 7 in the 2008/2009 flu season to 179 in the 2009/2010 season. In addition only 20 such cases were reported in the 20 year period between 1990 and 2009 and the estimates are that only 15% of these miscarriages are reported. The CDC is seemingly uninterested in this increase. Additional data and information can be found at www.ProgressiveConvergence.com. [2010 April] Local Parent Files Lawsuit Against Makers Of Gardasil A local mother is suing the makers of Gardasil claiming her daughter suffered from seizures and got brain damage after getting the vaccination....According to Wolf, her daughter needs constant care. She said the refrigerator is locked because Alexis has urges to eat constantly. Wolf said her daughter is narcoleptic during the middle of the day and cannot sleep at night and is in constant pain. 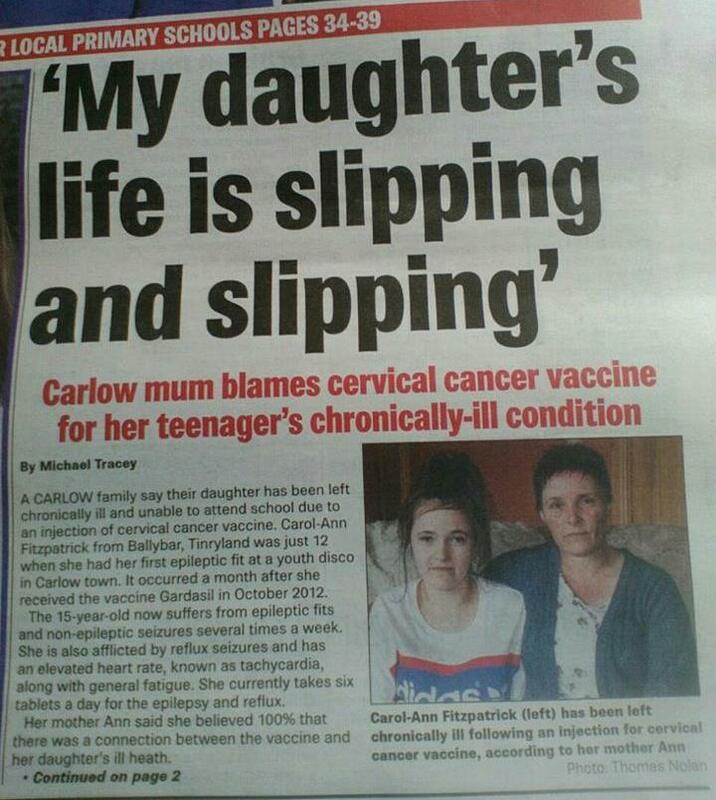 [2010 Feb] Gardasil Warnings Ignored Says Researcher Why, when Dr Harper asked the MoH not to promote Gardasil as a 'cervical cancer vaccine' because, in her words, this is simply not true, did the Ministry of Health ignore her request? [2010 Jan] New Web Site Launched For Gardasil Victims Another woman says her daughter came down with Hodgkins Lymphoma shortly after receiving a Gardasil shot and says, “I have located approximately 20 others with the same circumstance.” As of the summer of 2009, there have been more than 15,000 thousand reported reactions to Gardasil, including more than 3,000 injuries and 48 deaths. 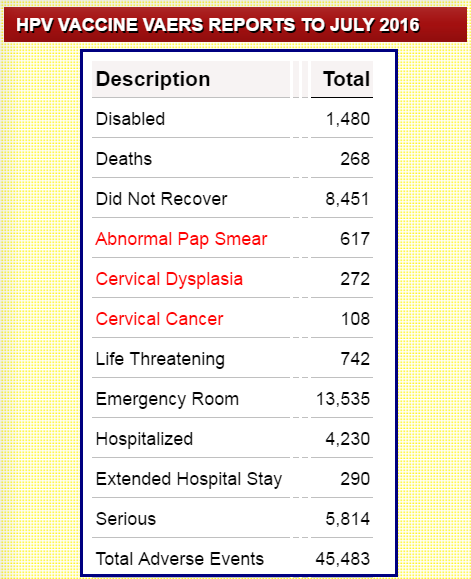 Fourteen of the girls who died after getting Gardasil were under the age 16. [2009 Oct] Gardasil Researcher Drops A Bombshell “I came away from the talk with the perception that the risk of adverse side effects is so much greater than the risk of cervical cancer, I couldn’t help but question why we need the vaccine at all,” said Joan Robinson, Assistant Editor at the Population Research Institute. [2009 Aug] Is the HPV Vaccine Safe? more than 12,000 side effects after 23 million doses were distributed. Ninety-four percent of the problems were not serious but 6 percent were, including patients who were hospitalized, permanently disabled or died. There were 32 deaths - one in over 700,000 doses. [2009 June] Gardasil. The vaccine that almost killed me, and maybe you. [2009 March HPV] Vaccine under suspicion For months, more than a dozen doctors have studied why Kenzie Bear has been so sick. The once-healthy, active 15-year-old from Stow suffers from constant nausea, debilitating fatigue, seizures and other symptoms that have left her unable to attend school or play sports. [2009 Feb] Gardasil: More Adverse Reactions and Scandals after just one injection a 13-year-old girl was diagnosed with Acute Pancreatitis, spent nearly 100 days in the hospital, and underwent two surgeries to remove Pseudocysts. Her family filed a petition for vaccine compensation seeking damages from the government. A group of Australian researchers found young women there who received the drug were five to 20 times likelier to suffer rare and severe allergic reactions. In the U.S., a 20-year-old woman suffered a stroke after receiving a second Gardasil injection. Two women overseas died after receiving their Gardasil injections and those deaths followed the deaths of three other young women who died in the U.S. days after Gardasil was administered. A 14-year-old girl experienced debilitating headaches, fainting spells, and arthritis-like stiffness and became so dizzy she could barely walk, was hospitalized, missed nearly one month of school, and suffered a seizure. Another 13-year-old began showing signs of a degenerative muscle disease after her third Gardasil injection; she is almost completely paralyzed. Now, the Rocky Mountain News is reporting about a 16-year-old girl who is sick all the time with constant exhaustion and nausea; hair falling out in clumps, ongoing episodes of passing out, numbness, and paralysis; dangerously low blood pressure; and severe back spasms that cause her to stop breathing. The family is convinced the reactions are a result of Gardasil vaccinations, which in her case, were given with a meningitis vaccine. [2008 Dec] Vaccines Get New Scrutiny A day after the shot, however, Sara complained that she was dizzy and her head was pounding. "Her doctor said the migraine­the first one Sara ever experienced­could have been caused by Gardasil, but it faded the next day, so I didn't worry," says Austin, of Westfield, Mass. But the headache struck again after Sara's second shot­and again after her third. Then, the crushing pain became constant, causing Sara to miss school, quit the soccer team, and spend weekends in bed. Now worried. Might Gardasil be to blame for Sara Austin's severe headaches? [2008 Sept] HPV vaccine shows higher rate of anaphylaxis: study The human papilomavirus (HPV) vaccine is up to 20 times more likely than other school-based vaccines to cause anaphylaxis, according to a study released Monday. [2008 oct] Mother questions HPV vaccine Louise Laplante, mother of a 10-year-old Grade 6 student at St. John School, said her daughter fainted in the hallway about five minutes after she received the vaccination last Thursday. Her classmates witnessed her kicking her legs and groaning briefly after she fainted...."If I would've known," she said, "I wouldn't have got her vaccinated. If other parents know maybe they won't get it for their daughter." [2008 Sept] Mother suspects Gardasil as reason for her daughter's serious reaction Megan Battilana is a healthy teenage girl, so healthy in fact that to her mother's knowledge she hadn't ever received antibiotics in her life. But that all changed when the 15-year-old girl was rushed to Headwaters Health Care Centre after having what her family suspects was an anaphylactic reaction to the widely-promoted cervical cancer vaccine Gardasil. September 29, 2008 - Catholic school district’s HPV vaccine stance addresses all concerns, says Bishop of Calgary - Bishop Henry: “We’ve probably read much more than Mr. Liepert has.” - Catholic News Agency - "To the health minister’s contention that the non-vaccination policy was not formed in consultation with the medical community, Bishop Henry explained that 'for months we’ve been reading everything' from Health Canada, cancer societies, individual doctors, web sites, and other sources. 'We’ve probably read much more than Mr. Liepert has,' he suggested. According to Bishop Henry, their studies had suggested the HPV vaccine was 'not adequately tested' and could have 'problematic dimensions' and 'disastrous side-effects.' Adverse reactions, including some deaths, have been reportedly linked to the HPV vaccine. In Bishop Henry’s view, there is a danger of the vaccination program 'using young girls as guinea pigs.' 'Does this profit anybody other than the drug company?' he wondered. Because of these concerns, Bishop Henry explained, there was 'sufficient ambiguity' for the school district to refuse to participate in the voluntary vaccination." [June 2008] HPV vaccine's suspected side effects cause concern; CDC says drug is safe Katherine Kimzey started suffering debilitating headaches, fainting spells and arthritis-like stiffness last November. Six weeks later, the 14-year-old Dallas resident became so dizzy she could barely walk. She was hospitalized and missed three weeks of school. Then, she had a seizure. For weeks, she bounced back and forth between specialists and was eventually diagnosed with epilepsy. [Nov 2007] Did Gardasil Vaccine Cause a 12-yr-old Girl's Paralysis Christina Bell says she had seen ads for the vaccine so after consulting with her doctor she agreed to have her 12-year-old daughter, Brittany vaccinated. Two months ago the Florida girl suddenly collapsed. Her mother says Brittany used to play softball and run cross country. Now she can't feel her legs.